Nutrition plays a major role in the profitability of animal production. Feed accounts for up to 70% of total poultry and swine production costs. The goal of a feeding program is to meet the nutrient needs of animals, based on optimal performance, with a mixture of ingredients, at the lowest cost. Achieving this goal requires a very complex process. The purpose of this article is to discuss the important elements of establishing the nutrient needs of animals and how to match those nutrient needs with available ingredients. The ultimate goal is to optimize profitability by matching established nutrient needs of the animal with appropriate ingredient mixtures. The nutrient needs of an animal can be depicted by the following graph. At low levels of nutrient intake, animals will exhibit specific deficiency symptoms based on the specific nutrient(s) that are deficient. In this stage, animals are not receiving a diet adequate to support normal growth or productivity. No animal should ever be fed a deficient diet. A feeding program in the sub-optimal stage will prevent deficiency symptoms, but the animal still is not receiving adequate nutrition to maximize growth, egg production, and/or profitability. The National Research Council publishes nutrient requirements for different species. These estimates are determined by researchers who critically evaluate the scientific literature and determine “best” estimates of nutrient requirements. These estimates are minimum standards and are not to be considered recommended nutrient allowances. This is mainly because the estimates include no margin of safety margin. The National Research Council publishes nutrient requirements for different species. These estimates are determined by researchers who critically evaluate the scientific literature and determine “best” estimates of nutrient requirements. These estimates are minimum standards and are not to be considered recommended nutrient allowances. This is mainly because the estimates include no margin of safety margin. The stage of optimum nutrition typically optimizes profitable production. In this stage, animals are receiving nutrient levels sufficient to maximize productivity profitably. Nutrient requirements in this stage are best determined through sound production research. 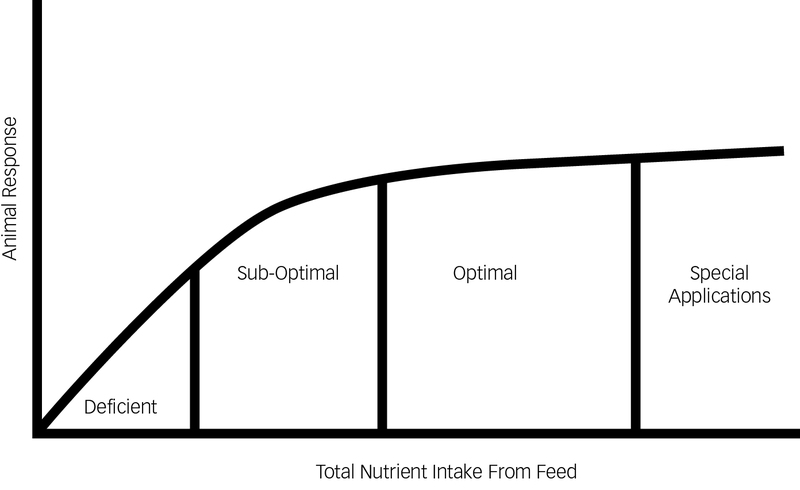 The law of diminishing returns would suggest animals should be fed just before maximized performance in this “optimum” stage to achieve maximum profitability. Often times this stage of nutrient levels has been historically used to provide a safety margin to account for variability in animals, feed ingredients, etc. However, as ingredient costs increase, the acceptable safety margin continues to be challenged. Beyond this optimal stage of nutrition is a stage for special applications. Animal under immune challenges or applications where animals are being fed to meet a specific market demand may require nutrient levels in this stage. Otherwise, animals fed nutrient levels in this stage are only improving performance minimally or not at all. If there is not a specific need for nutrients at this level, feed cost is increased with no beneficial financial return. Feed is made up of several ingredients, which are grouped into ingredients providing energy (fats, oils and carbohydrates), protein (amino acids), vitamins, and minerals. Cereal grains such as corn, wheat, and barley, plus additional fat will be used to mainly provide energy. Soybean meal, extruded and expelled soybeans, canola meal and poultry byproduct meal are used in diets to mainly provide protein. Ingredients must be evaluated for their nutrient content to help establish the amount of each ingredient to be included in the diet. Likewise, ash is composed of several minerals (calcium, phosphorus, sodium, chloride, etc. ), which are critical nutrients required at specific amounts in poultry and swine diets. Analysis of ash alone gives very little information about the suitability of an ingredient to meet the nutritional requirements of the animal. More detailed analysis of the actual minerals making up the ash component is needed. In addition, the extent of how well these nutrients are utilized by the animal (usually reported as digestible or available nutrients) can also be utilized in feed formulation and are determined through extensive research. Chemical methods used to analyze ingredients are expensive and cumbersome, often requiring days to weeks to complete. However, newer equipment and procedures have been developed, which enable the rapid evaluation of most materials. For example, near-infrared reflectance spectroscopy (NIR) is one technique used by Wenger Feeds to quickly evaluate feed ingredients for amino acids, protein, fiber, and fat. Nutrient content of ingredients can vary significantly from one supplier to the other. For this reason, it is important to determine the nutrient content of an ingredient by supplier. Nutrient content of an ingredient can also vary by season. Cereal grains like corn fill out ears poorly in drought years, which can reduce corn quality. New crop corn and soybean meal derived from new crop soybeans typically have a different nutrient content than corn and soybean meal from a previous year’s crop. Feed ingredients used in animal feeds must meet all guarantees and any pre-determined buying specifications. These guarantees include both physical and chemical parameters. The physical evaluation provides preliminary information on the quality of the ingredient. This involves assessing physical qualities such as weight, color, smell, and whether the ingredient is contaminated with foreign material. This physical evaluation typically occurs in the ingredient receiving area of the feed mill and is a key step in the quality evaluation of a feed ingredient. Although the average composition of many common ingredients is known, ingredients can be variable. For this reason, the average composition of ingredients is typically discounted to account for the degree of ingredient variability. This helps to meet targeted nutrient needs, regardless of ingredient variability. Nonetheless, finished feeds should be analyzed on a routine basis to verify that the process used for ingredient analysis results in the expected final feed. The most important area to evaluate the suitability of an ingredient testing program is in animal productivity. When feed is given to animals, they are only able to break down part of the feed and absorb it into the body for maintenance, growth, egg production, lactation, etc. The rest is lost through feces and urine, which are excreted together by poultry. Animal productivity defines the real nutritive value of the feed and must be measured and utilized as part of an ingredient and animal nutrient needs evaluation. Ingredients must also be researched to determine optimum levels in feed. Many byproducts can be potentially used to reduce feed cost, but we must understand the influence of using the byproducts on animal performance. Often byproducts with proper nutrient values can be formulated into feed and result in no change in animal performance. Typically, there is a maximum inclusion level at which higher inclusion levels result in reduced animal performance and/or the ingredient is no longer cost effective to use. These maximum inclusion levels can also vary by productive stage (i.e. maximum inclusions might be lower in starter diets than finishing diets). Wenger Feeds has research capabilities to evaluate nutrient requirements and ingredients for layers, pullets, broilers, and grow-finish swine in production settings. These research locations are designed to test nutrient levels and ingredients in a “controlled” research setting but still in facilities similar to those found in actual animal production. Examples of research conducted in these facilities include: an evaluation of maximum inclusion levels of Distiller’s Dried Grains with Solubles (DDGS) in layer diets, meeting the body weight goals in pullets, estimating lysine and energy requirements of grow-finish pigs, and the influence of nutrition on skin and feather quality in broilers. In summary, nutrient levels less than targeted levels can result in suboptimal animal performance, and nutrient levels in excess of targeted levels add unnecessary costs. Both result in reduced profitability. The goal in formulation is to meet targeted dietary nutrient needs with sound, cost effective ingredients critical to meet financial goals.